As a child on early forays into Dublin, I’d sit upstairs on the bus looking over the jumbled roofs of the Liberties. Church spires punctured the sky, shifting landmarks against the sea of slate as the bus crawled down The Coombe, toiling up past St Patrick’s and Christchurch cathedrals on its way into the city centre. I recall a friend of my mother’s laughing as I blessed myself passing Saint Patrick’s. It was a Protestant church! In fact both cathedrals, though almost adjacent, are Church of Ireland. 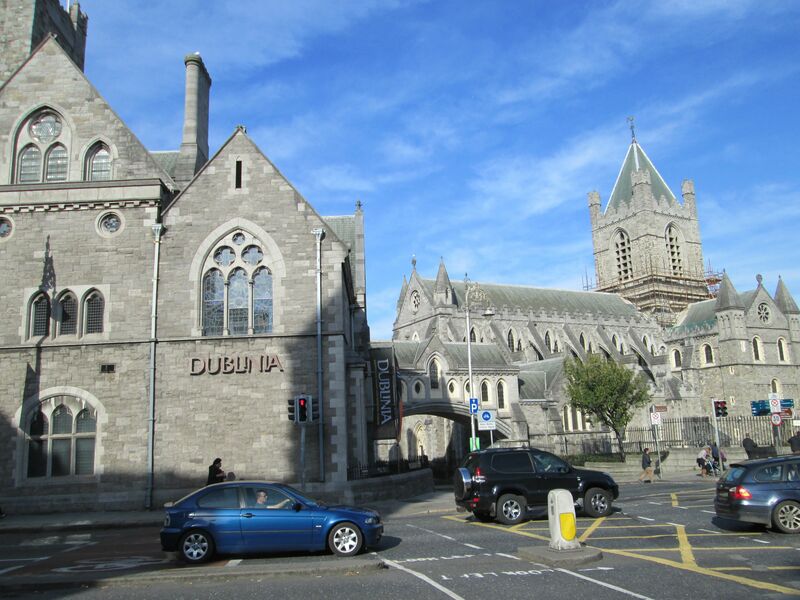 However, the persistent Catholic claim on Christchurch means the Diocese only maintains a Pro-Cathedral for Dublin. A neat little girl and not a bit shy. Would take her back home in the sweet bye and bye. 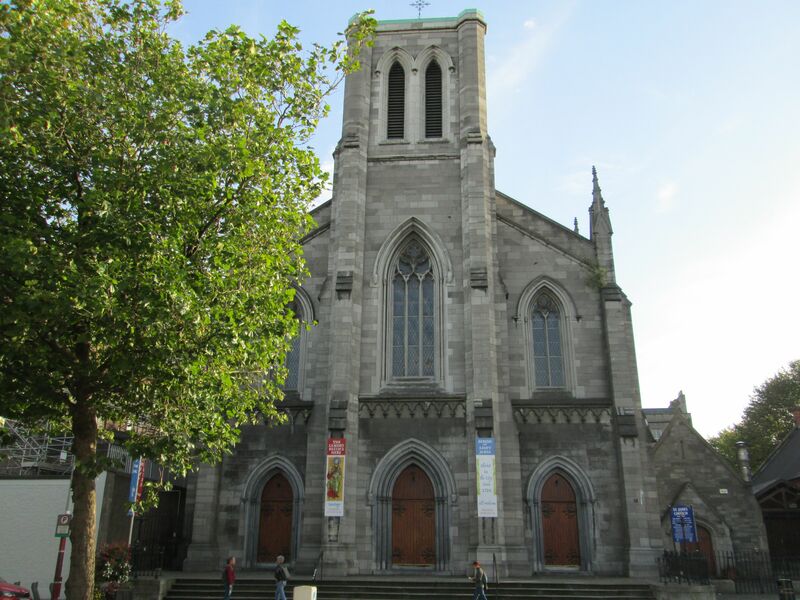 Christchurch Cathedral marks the ancient centre of Dublin. It was founded in 1028 by King Sitric Silkenbeard. Dublin, more than a decade after the Battle of Clontarf, was still Danish. Sitric, one of the few survivors of the battle, became determinedly devout in his later years, the cathedral his enduring legacy. The king didn’t stay in his city to die. His throne was usurped and he decamped to York on the eve of the Norman invasion of England. A century later, the Normans came to Ireland’s green shore. Strongbow (Richard De Clare) took the spoils, including King Diarmuid’s daughter Aoife. Having defeated the Danes, in Dublin, Wexford, Waterford, and ultimately at Bloodybank in Bray, he funded the restoration of Christchurch for Archbishop Laurence O’Toole. Strongbow’s remains were interred there, while his effigy reclined peacefully on the tomb. The original stone knight has not survived, however, destroyed in one of the cathedral’s several collapses; the current figure being a substitute. St Patrick’s, Ireland’s largest church, is close by at the foot of Patrick’s Street. Another ancient institution, it was, up to Tudor times, the equivalent of the city’s university. It’s most starred connection is with Jonathon Swift, Dean of the cathedral and creator of the permanently resonating world of Gulliver’s Travels. Next door is Marsh’s Library, a precursor of the public library. Neither borrowing nor lending were the thing then and readers were locked in cages with their chosen book to stem pilferage. Librarians these days are too soft by far. While no visible barrier currently exists to explain the existence of two cathedrals in such proximity, that was not always the case. 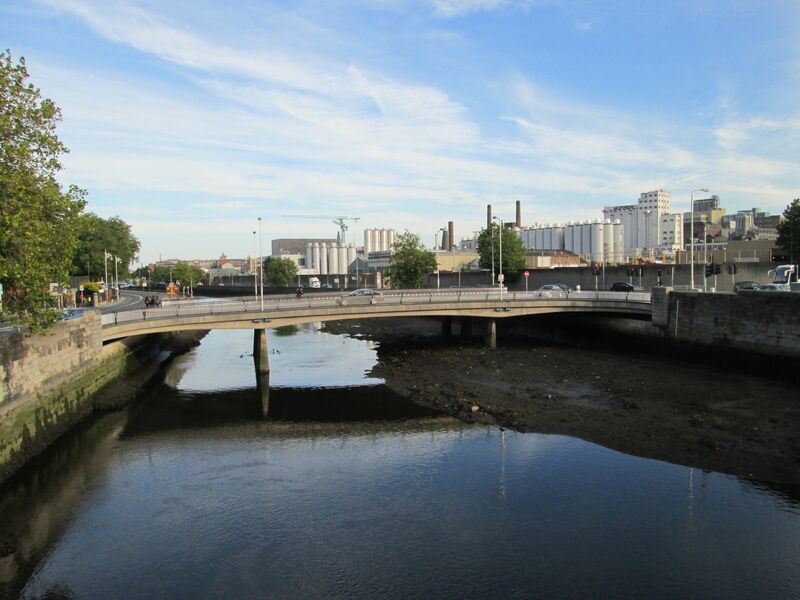 All those centuries ago, Christchurch was within the city walls, St. Patrick’s, without. Those ancient walls have well and truly crumbled. A portion remains to the north of St Audeon’s Church, encompassing the only remaining city gate. A couple of fragments of the wall have been unearthed nearby. At the corner of Cornmarket and Lamb Alley, a good chunk of wall gives you some idea of where the western extent of the city was. Beyond here lies an area known as The Liberties. Liberties were manorial possessions, usually attached to a monastery that enjoyed benefits and independence from the walled city. Today the term applies to two ancient liberties, The Liberty of Saint Thomas and Donore, and the Liberty of Saint Sepulchre. Saint Thomas’s is delineated by its two main axes, The Coombe to the south and here, all along Thomas Street as far as James’s Street to the west. St Sepulchre’s ranges east from Patrick’s Street and Clanbrasil Street, to Whitefriar’s Street Church off Aungier Street. The sunlight was fading and the evening grew dark. My arms were around her up there in the park. A striking landmark nails the start of Thomas Street. From afar it always seemed to me a castle in the sky, floating tantalisingly out of reach on those distant bus journeys. 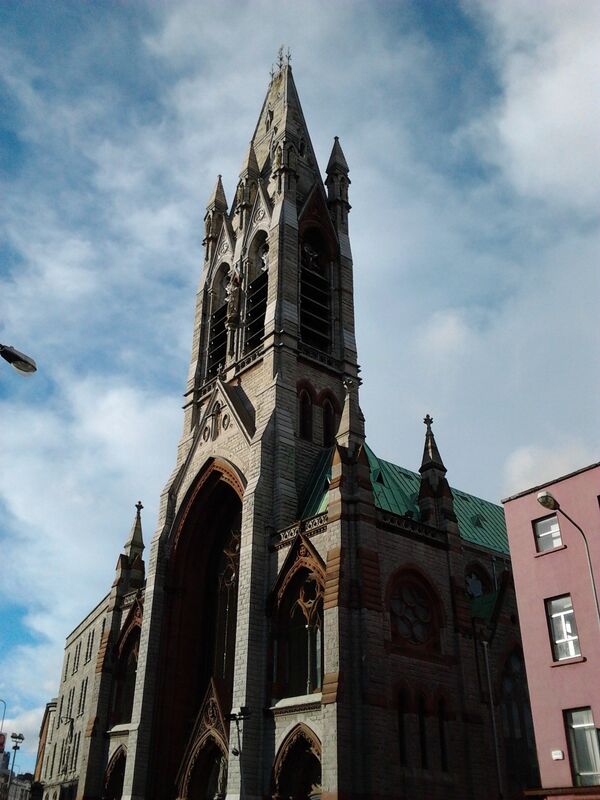 It is the fabulous, metred spire of the Church of St John the Baptist and St Augustine, the highest in Dublin, rising to more than two hundred feet. The church was built in the late nineteenth century where a monastery and hospice had stood in Norman times. It was designed by Edward Pugin. He was of French Hugenot stock and the building does indeed have something of the air of a French chateau about it. Described as a poem in stone by John Ruskin, it is that, it also it sings with gothic romance. The twelve statues set into niches on the tower were rendered by James Pearse, father of Patrick Pearse. Harry Clarke, that most gifted Irish exponent of Art Nouveau, is responsible for the stained glass windows near St. Rita’s side-altar. It is an interior for prayer and contemplation, a welcome respite from the antic city outside. John’s Lane Church, Pugin’s ‘Poem in stone’. Thomas Street evolved as a market street without the walls. Cornmarket would have been at the old western gate of Dublin. Brewing, distilling and weaving, especially silk weaving, became the main industries of the area. The busy thoroughfare was often the focus for more than industry and commerce. 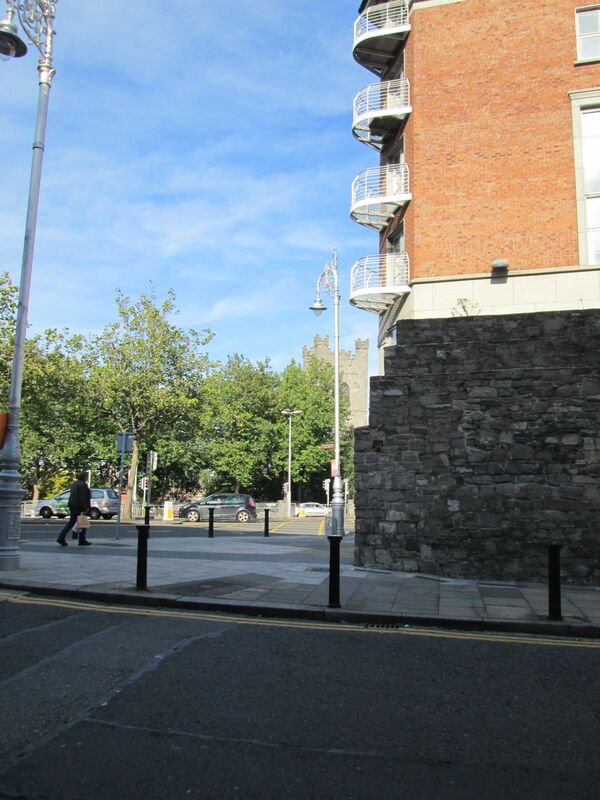 Thomas Fitzgerald (Silken Thomas), Earl of Kildare, made this the site for his rash assault on Dublin Castle in 1535. His forces used the upper stories as a causeway of sorts in their attempt to breach the city walls. The citizenry remained firm however, and Thomas was ultimately captured and executed. The original monastery, the manorial centre of the Liberty, was at Thomas Court, at the top of Marrowbone Lane. It had extensive land holdings well beyond the immediate area, including lands at Ardee in County Louth and Kilruddery in Bray. At Henry VIII’s Dissolution of the Monasteries, these lands were given to William Brabazon with the title Earl of Meath. Hence, some of the names you will notice in streets throughout the liberty. Robert Emmett had no more luck than Silken Thomas with his rebellion in 1803. Despite careful planning, his assault on Dublin Castle degenerated into a grim fiasco, with mob violence along Thomas Street. Emmett was executed for his trouble, at a gallows close to St Catherine’s Church. Music and art have become a more notable feature of the area than riot and rebellion. Or perhaps they’re simply different facets of it. The National College of Art and Design located to the old Power’s Distillery in the nineteen eighties. Myself, amongst others, has tramped its hallowed halls. Some never escaped at all. BIMM, originally the Brighton Institute of Modern Music sends stray notes and students into the air around Francis Street. Vicar Street has become Dublin’s most comely music venue.Here, I’ve seen Patti Smith gather a group of local musicians together for a Celtic take on Smells Like Teen Spirit. Imelda May radiate love and rockabilly as the local girl made good. I’ve seen Jack L hold the audience in his hand, with the lights down and the electricity off, with nothing but a concertina and a voice to evoke the troubadour of another century. The Waterboys are coming soon, and there’s always something there. These days, Thomas Street remains one of only a couple of places in Dublin where street trading is permitted. It is, always has been, a rambunctious street. 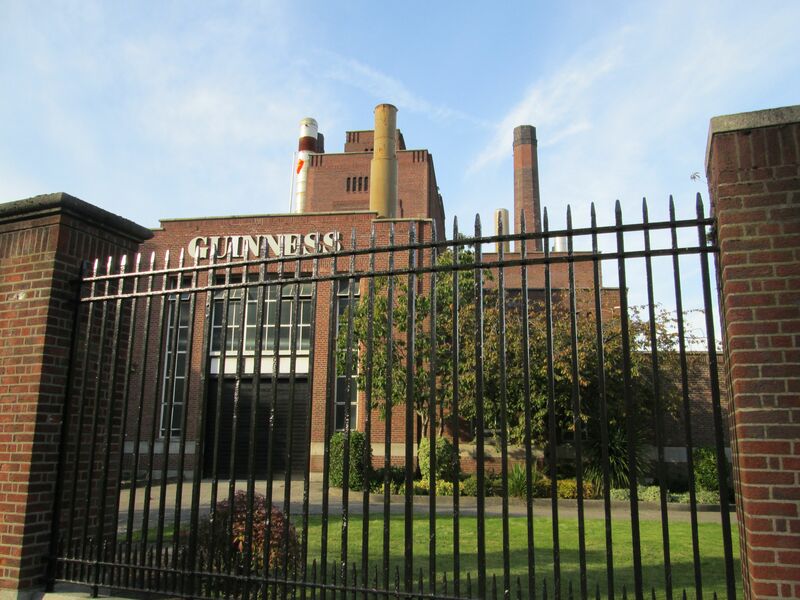 The heavy aroma of hops seeps through the air from Guinness’s brewery to the west. Arthur Guinness, from Celbridge in Kildare, founded his brewery in 1759 at Saint James’s Gate. The distinctive Stout has become something of a national emblem. As the country lurched from boom to bust, the brewery celebrated two hundred and fifty years with the inauguration of Arthur’s Day, raising a pint to the man at one minute to six on the chosen day. The great and the good, as usual, getting a whiff of people having fun, sucked in their cheeks, waved a boney finger of prohibition. But they can’t stop you doing it if you so desire. A visit to the Guinness Hop Store nearby, can be topped off with a pint and a panaromic view at the Gravity Bar. Or you can simply walk into any bar. Whether I’m easy or whether I’m true. Where Thomas Street ends, St James Catholic Church marks the beginning of the street of that name. It can also be the beginning of a more ambitious walk. Passports for the Camino de Santiago are available here, a first step on the pilgrimage across northern Spain to Finistere, the very end of the earth. For me, I take a right turn down Steven’s Lane to Houston, formerly Kingsbridge Station. A fine piece of Victoriana from 1846, it’s the principal western rail terminal for Dublin. also serving the southwest. There’s a good bar to the side, and seating outside not far from the Liffey. To the west lies the Phoenix Park, to the east lies the city. The Luas line carries trams regularly to and fro. I will catch one, when I’m ready, leaving me conveniently near Connolly Station for my Dart home.